God gave us beer. We should drink it. This past weekend, I attended The Festival. What festival? "The" Festival, obviously! The Festival was an event showcasing the import catalogues of two of the United States' biggest beer/mead/cider importers: Shelton Brothers and 12%. This was a stunning two day, three session event which featured many of the world's most famous, highly rated, and hard-to-find beers, and it also marked the first time that several small, esoteric brewers had their beer poured and tasted on US soil. Nearly every brewery's brewer was in attendance. Whether hailing from New Zealand, Belgium, Japan, or Germany, most often the individual pouring and describing the beer was the man or woman who made it. This was of course an amazing opportunity for the taster, but also for the other brewers; they, too, are beer lovers after all! For myself, this event gave me an opportunity to become more familiar with many of my European favorites. (I am, admittedly, one of the Urbain groupies.) But more than that, it afforded me a chance to encounter beers I have never before had, often beers I had never even heard of. Without this event, it would have taken me years (and countless dollars) to visit each of these breweries and taste the beer. But now, I have a few new favorites to look out for. What follows is the short-list of my own personal highlights, the standouts, and the beers I would encourage the reader to taste if ever given the opportunity (and, if the brewers and importers have their way, that opportunity should become a lot more frequent in the coming months). 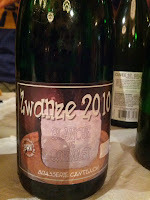 Brewing sour beers (Lambics, Krieks, and Gueuzes), Cantillon is one of the world's most renowned breweries. Founded in 1900 by Paul Cantillon, the brewery has been handed down four generations to its current brewmaster, Jean van Roy. 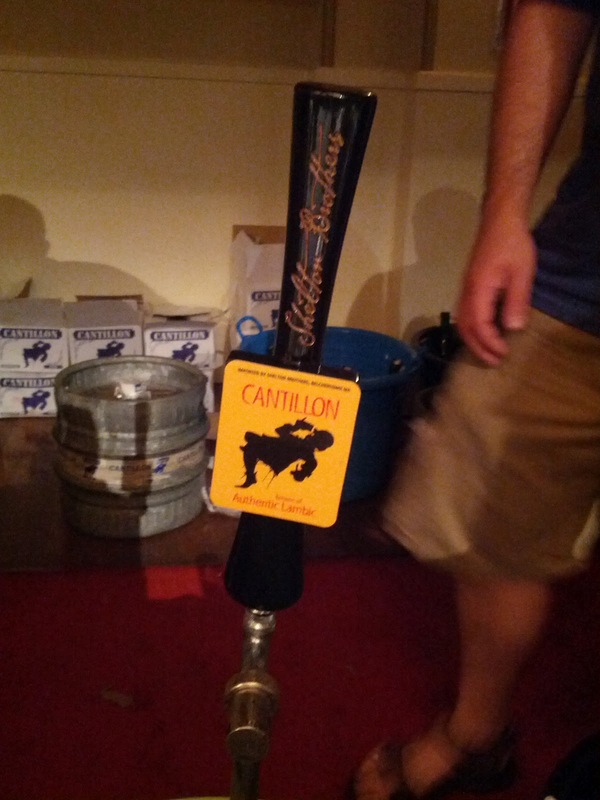 I have been familiar with Cantillon for many years but had never had an opportunity to taste it. Honestly, I was a little concerned: when a beer (or anything, for that matter), gets this much hype, it's pretty hard to live up to the expectation. There are few beers in the world that cause me to actually melt. It's a feeling of being in the presence of something so awesome that it thoroughly overwhelms your senses. And despite a tremendous number of great beers at this festival, only two beers elicited this response (Cantillon being one of them). Jean was pouring eight different beers, three of which was an Oude Lambic aged in three different barrels since March 27, 2010. It was remarkable to compare the three: two of them were wildly tart and astringent, but barrel number two was perfectly rounded, excellently balanced, sour and tart, but not overwhelmingly astringent or mouth puckering. Fruity, spritzy, green apple, Wow! This beer is now the benchmark of what a sour ale really is. I really feel lucky to have tasted it! If it weren't for Cantillon, this would have been my Gold Medal beer. Perhaps due to the fact that I spend about 25% of the year in Germany, I have become obsessed with great German beer. I am determined to find the standout German brewers who are willing to experiment and work outside the box. Look no further, Mr. Kirchoff: you found your man! Sebastian Sauer is the brewmaster of Freigeist Bierkultur [no website available], a small brewery in North Rhine-Westphalia, and he is really interested in redefining German beer. When I asked him if his beer is available in other parts of Germany, he only laughed. "No," he explained, "German's aren't interested in this type of beer." How sad! 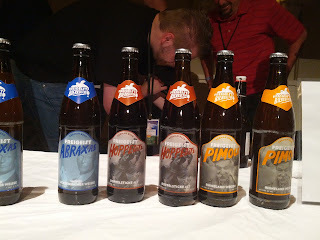 Here is a phenomenal brewery, but his entire market is outside the country! He explained that Italy, Spain, Austria, and now the US are his biggest market (I heard an identical report from Urban Winkler of Klosterbrauerei Weissenohhe). Thankfully I still spend the majority of my time in the US, and I already look forward to tasting this beer again. Sebastian's Gose is easily the best damned Gose I've ever had (so sorry, Leipzig!). Ever so slightly sour, there's lots of coriander, and an excellent woodiness that was unlike anything I had tasted. In fact, I couldn't even identify the flavor until I asked him. Sebastian explained that he includes spruce branches to the end of the boil, harkening back to more ancient German brewing techniques when spruce branches were the only way to strain the wort. He truly found the perfect amount, because it wasn't at all piney, but rather had a depth I've never experienced in a Gose. I know I can hardly wait for Freigeist Bierkultur to arrive in Massachusetts, because I may have found one of my new favorite beers. Bizarre. Simply bizarre. Well, and a litte awesome. 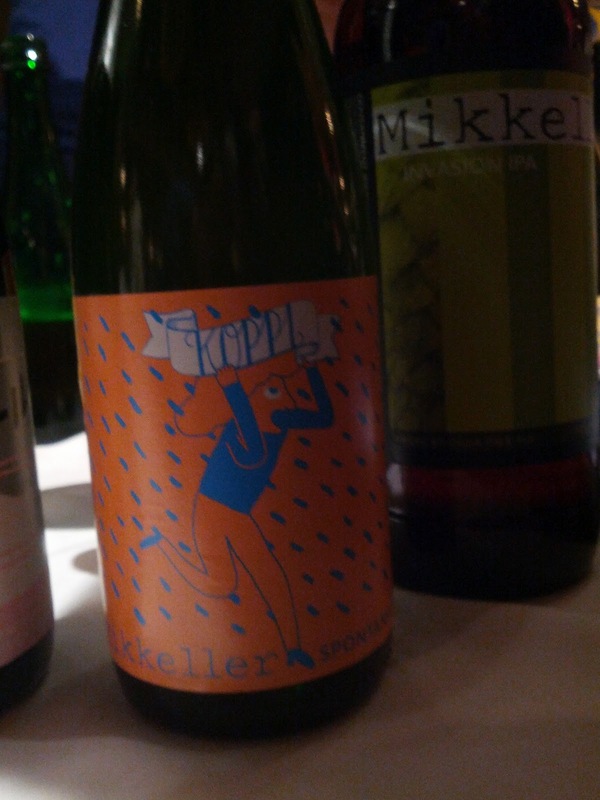 SpotanKoppi from famed brewery Mikkeller is a spontaneously fermented coffee IPA. Hoppy, sour, and fresh coffee all rolled into one. One sip just makes your mouth and head go "Huh?" It's a beer you should really try once, but you just might want to share the bottle. 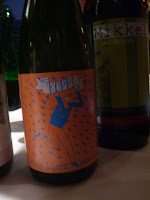 Omnipollo is the brainchild of Henok Fentie, the one-time marketing manager of Swedish pub group Bishop Arms. 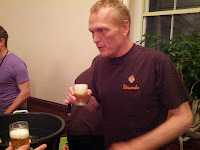 He studied Belgian brewing techniques with Dirk Naudts of De Proef in Ghent, and has since launched four different beers. 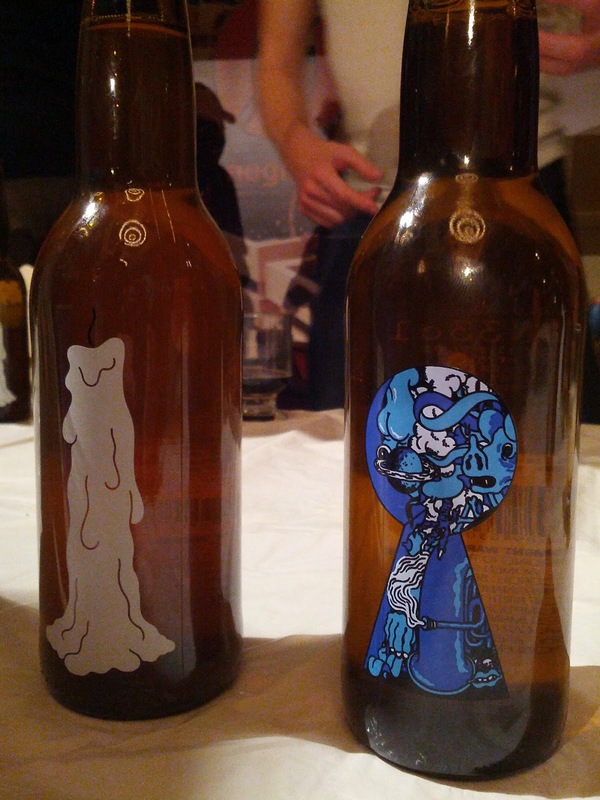 At The Festival were Leon (pictured at right), a 6.5% single malt IPA with champagne yeast; and Mazarin (the bottle on the left), a very hoppy session pale ale. Both beers were very nicely crafted, but the label is what really caught my eye. 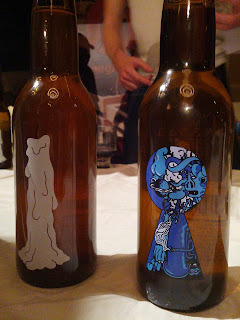 Both labels are painted by Stockholm-based graphic designer and illustrator Karl Grandin. I really believe a great label is among the most important aspects when considering a beer's distribution. When I walk into my local beer shop, I see a sea of beers I've never tasted, and many I don't know. When consumers are faced with a choice of unknowns, and all other variables are equal, we buy the most attractive product. This is a beer that doesn't even name the brewery or style on the front of the bottle; if I want to know more about it, I have to pick it up! Now, Henok has me physically holding his product, and I'm thus much closer to buying it. Clearly this is a brewery that thinks about marketing! "The Westvleteren [beer] is sold exclusively at the abbey store, and only after having made a reservation by telephone. See our web page Up-to-date Information for information regarding when reservations will be accepted for which beer and how much beer can be reserved at any one time. Then you can make an appointment (date and time) with the beer phone operator, providing the license plate number of the car which will be used to pick up the order." This festival marked the first time that the Monks of St. Sixtus have allowed their beer to be sold in the United States. It is the first time that the beer has been legally poured on US soil. You can imagine how excited everyone was to have the opportunity to buy some Westy 12 for themselves (even at the steep price of $85 for a six pack). Westvleteren 12 is my all-time favorite beer. The first time I had it was with a friend in Dem Haag: my first time in Belgium, we found a place that had bottles for sale. I had not previously heard of it, but I was forever changed: I had never realized beer could be so extraordinary. That same year, I pulled off one of the greatest trades in my life and swapped a case of Dogfish Head 90 for a case of Westy 12. I continue to savor those bottles. I consider myself very lucky to have had so many opportunities to taste this rare beer, and, as such, I know the beer pretty well. But the beer poured at The Festival wasn't the Westvleteren I know and love so dearly. It was watery, full of an upfront bubblegum flavor, lacked all the richness of dark dried fruits, was missing the intense spiciness of clove, cinnamon, and allspice, and was as one dimensional as it could be. It not only wasn't the best beer in the world, it wasn't the best Quadruple in the building. And I wasn't the only one saying it. There were a lot of people who had never before tasted this beer, and the majority of tasters I spoke to concurred: it was good, but it certainly wasn't great. Having never brewed in such quantities before, the monks made a mistake and didn't follow the recipe perfectly. Having never prepared beer for shipment, the monks didn't budget time properly and had to rush the aging process, thus producing a less complex beer. Similar to the conjecture above, the beer is actually exactly as it should be, but the monks shipped it too soon, and these bottles need to age in a cellar for several months before they are ready for drinking. The distributors and handlers of the beer did a poor job, and the beer was stored in bad conditions thus damaging the product. The last hypothesis doesn't seem likely: considering the same distributors moved every beer in the building perfectly, I'd wager they treated Westy 12 with kid gloves. But the first three theories are entirely reasonable to assume. If the third theory is correct, this beer, if left alone, will be truly wonderful and life changing given time. I really hope that that's the case. But, as I decided not to buy it after tasting it ($85 is a pricey gamble), I suppose I'll never really know. I'm an avant-garde pianist & composer. But I'm also a brewer and a lover of great beer. My concertizing has introduced me to many of the world's greatest and most unique breweries. I've gotten to visit great places and meet great people all over a pint. Visiting the monks at Westvleteren and witnessing my wife's beer revelation. Sharing pints with a fellow composer in a small country town in rural England. Experiencing great German food for the first time over a glass of Vetters 33 in Heidelberg. Meeting brewer Dan Glidden over at Squam in New Hampshire. I finally realized I should be chronicling these experiences! It was only natural that eventually I would need to learn more about this craft. And so in March of 2011, Churchyard Brewery was born. This blog, then, serves one major purpose: to share my favorite beer-related experiences. Whether it's brewing a beer here at the brewery (aka my home! ), tasting a great beer out on the road, or simply sampling a glass of a nice local beer, this blog seeks to share these experiences with anyone who cares. Churchyard Brewery: for the love of great beer.